As gaming's original icon, Pac-Man has enjoyed a long and varied career. He's munched Power Pellets on dozens of different platforms since his 1980 debut, starred in platform games on the Super Nintendo, raced go karts on the GameCube, had a Top-10 single on the US charts, and even worked under the baton of Mario maestro Shigeru Miyamoto in the superb Pac-Man Vs. 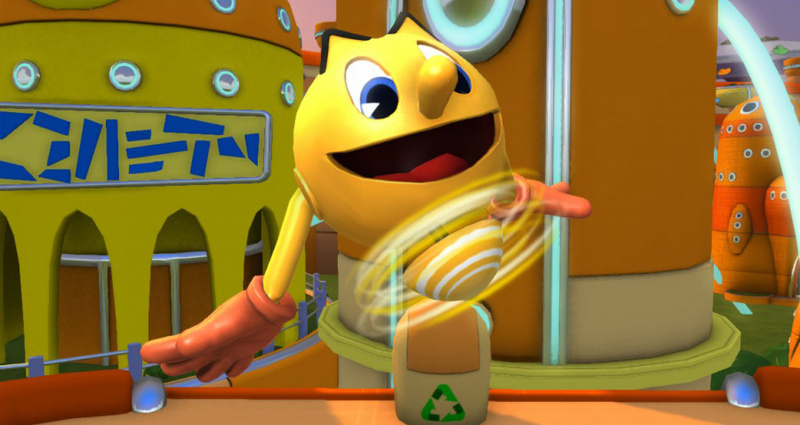 Most recently, he's been the star of a new computer-animated children's television show Pac-Man and the Ghostly Adventures, the inspiration behind Pac's first foray onto the Wii U. 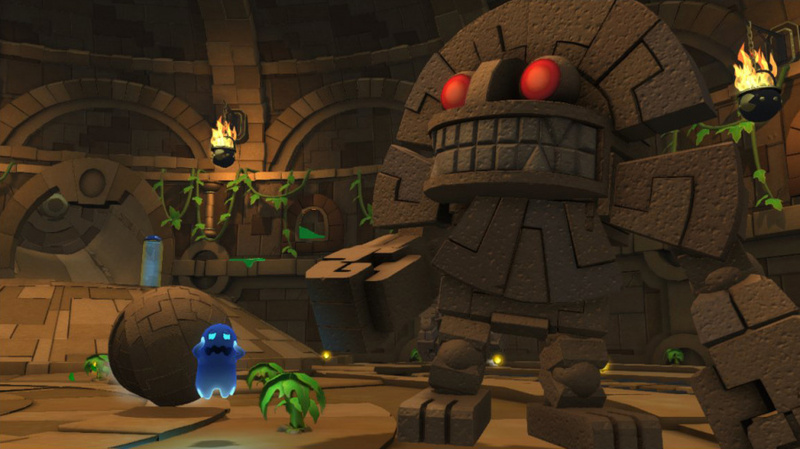 Ghostly Adventures the game might not be Pac's finest ever accomplishment, but this simple, thoughtfully-designed 3D platformer will be a blast for fans of the show, and well worth a look for everyone else. Like the TV series it's based on, Ghostly Adventures tasks a teenage Pac-Man - the sole carrier of the ghost-munching power of the ancient Yellow Ones - with saving Pac-World from a spectral invasion at the hands of the suitably evil-sounding Betrayus, Lord of the Ghosts and King of the Netherworld. Told through short voiced cutscenes and dialogue sequences between Pac, his friends, and the delightfully named scientist Sir Cumference, the story is a pun-filled ride through cartoon tropes that will be fun for kids, without distracting too much from the action at hand. 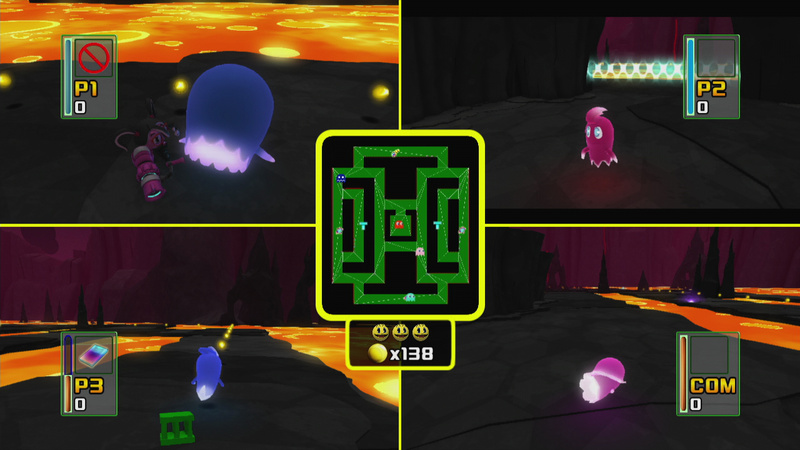 Gameplay wise, Pac-Man's latest adventure is a 3D platformer that hearkens back to the Nintendo 64 and Dreamcast days: you'll hop, bop, and double-jump your way through levels, defeating enemies, navigating floating chains of disappearing platforms, solving very simple puzzles, and grabbing a whole heap of different collectables on the way to the goal. Whether that's a delightful discovery or a deal-breaker will depend on your taste; for us at least, the simple platforming strikes a comforting chord. Fitting for the original ghost-gobbler himself, Pac's main attack is a satisfying chomp. It has the homing power, chaining ability, and generous hit detection of Sonic's post-Adventure homing attack, and bouncing from enemy to enemy in snappy lines feels fantastic. If you can munch five in a row, you'll charge up a special attack that lets Pac-Man scare any nearby ghosts senseless (by making a funny face, of course) and - in classic arcade style - render them blue and defenceless in the process. 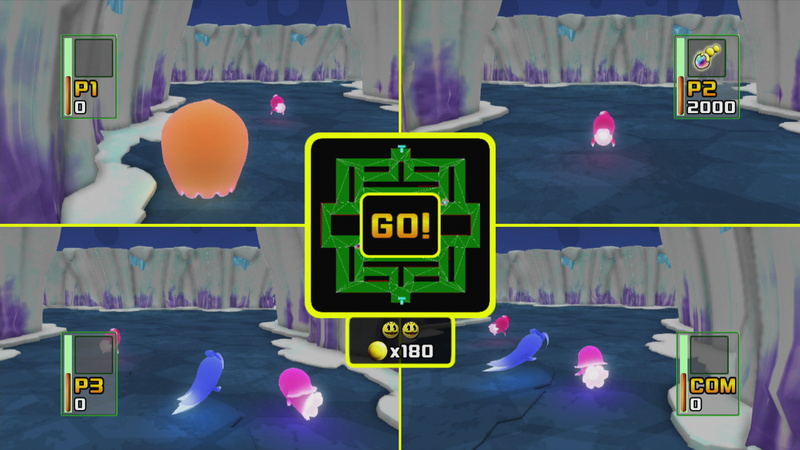 Plain-vanilla Pac's attacks are only part of the picture, however; Ghostly Adventures introduces Kirby-esque transformations to the mix, each of which gives Pac-Man a new power and play-style. By chomping on Power Berries, you'll be able to turn into one of several different forms: Ice Pac lets you freeze enemies and objects - to turn a fountain into an icy platform to reach hidden collectables, for instance - while Flame Pac lets you defeat frosty opponents and melt away obstacles. Chameleon Pac gives our hero a sticky tongue to lash enemies and swing from certain points, as well as go invisible at will, while Rubber Pac (accompanying catchphrase: "Excuse me if I dribble a little!") 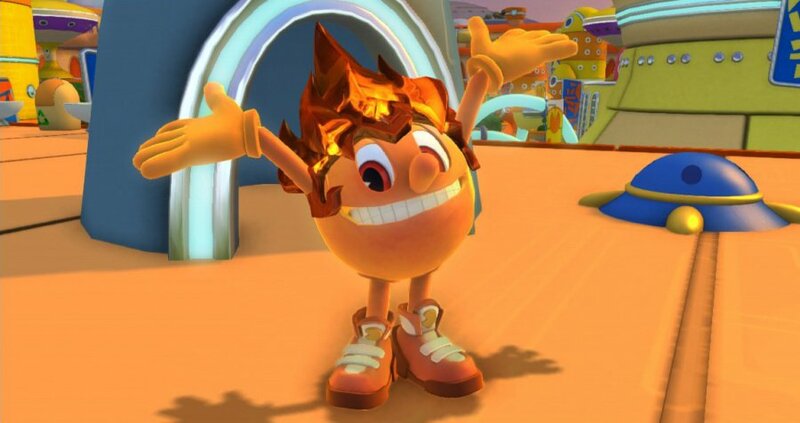 returns Pac-Man to his rounded roots by transforming him into a super bounce ball, able to wall jump with abandon and stun-bounce groups of enemies. There are lots of different transformations, and finding new ones to use throughout the game is always exciting. Like Mario with his mushrooms, Pac will revert back to his normal self if he takes damage - but since getting past puzzles and obstacles often requires a specific transformation power, Power Berries regenerate and are never far off when you need them. It's a welcome safety net that makes it easier to experiment, and keeps frustration at a bare minimum - both very positive things for a game aimed at younger players. There are six worlds for Pac to find his way through in all, and while the levels tread well-worn platforming ground - there's the obligatory ice, fire, and jungle stages - there's also a lot of subtle charm in the environments. The futuristic floating city of Pacopolis is a real highlight, with its happily hovering hydroponic platforms and constant stream of ghostly sky-traffic, but there are lovely little touches in each area - like the second world's temple walls, adorned with neon, pseudo-Aztecan approximations of classic Pac-Man shapes. The level design is simple, straightforward, and fun, easy enough for younger players to get through without trouble, but with secret rooms and collectables hidden for more thorough adventurers. It's definitely rooted in an earlier generation of platforming games, with players usually given one or two tasks at a time: defeat all the enemies in a room to open a door to the next, arrange blocks of ice to activate a transporter, and so on. It streamlines stages, and levels tend to play out as a sequence of discrete areas, with little to no backtracking. There are plenty of checkpoints to keep things moving, though they're sometimes spaced a bit widely for the intended audience - especially since the floating stages mean falling out of bounds is nearly always a possibility. Happily, tight controls make it easy to steer clear of enemies and edges, and you can play using the GamePad (with support for full Off-TV play), Wii U Pro Controller, Wii Classic Controller, or Wii Remote & Nunchuck. Unfortunately, Ghostly Adventure's double-jump throwback to a bygone era of 3D platforming isn't totally rose-tinted, thanks to a decidedly dated camera. It's not the worst offender we've seen in recent years, but it does feel distinctly second-rate, often failing to keep up with changes in direction and sometimes hiding enemies and platform edges from view. You can control the camera with the right analogue stick, which definitely helps, but it's hardly ideal - and there are fixed-camera sections where it isn't even a possibility. Clicking the stick down will snap the view back to behind Pac, which makes for a very welcome feature in a very awkward place; you'll need to use it often enough that mapping it to one of the unused shoulder buttons would have been far preferable. Worse, the camera reset doesn't seem to work at all on the Pro Controller, so players opting out of the GamePad will have to make due with manual control. 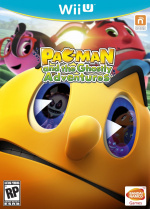 Most children's games tend to be rather barebones affairs - but Pac-Man is no ordinary game character, and Namco Bandai has wisely stuffed Ghostly Adventures full of winking retro references that play off of the Yellow One's legendary status. Pac-Man eats ghost eyes for extra lives ("Kinda gross, I know!" quips Sir C), Inky, Pinky, Blinky and Clyde are fellow students at Pac's school - which is carpeted with the classic Pac-Man maze pattern, incidentally - and at the end of each level, there's a big juicy piece of iconic fruit to much. Collecting enough of these level-ending lemons, cherries, pineapples, and zucchini will let you repair the arcade cabinets in the halls of the high school hub world, all of which eventually become fully playable, self-contained mini-games. All of these little touches help make Ghostly Adventures a great game for older players - who remember Pac in his prime - to share with their little ones, especially if they're fans of the show. It's as fun for parents to watch as it is for kids to play, and the Ghostbusters and Gears of War (!) references point to that being entirely intentional. And for kids and adults alike, Pac-Man and the Ghostly Adventures really is a pleasure to see in motion. It's colourful, moves at a good clip, and - most importantly - is full of charm. Each time Pac-Man shoots through the first level's clear transport tubes, for instance, you'll be treated to a different mini-cutscene; sometimes he'll burst out in style, rolling through confetti into a triumphant "Tadum!" pose, and sometime's he'll fall on his head and dust himself off before continuing. Ghosts fly about in the backgrounds, trees sway in the breeze, hidden pellets pop out of sparkling bushes to the tinkling sounds of an ascending scale, and a subtle but incredibly satisfying slow-mo effect kicks in when you chain your chomp attacks, to wonderful effect. The soundtrack's springy, orchestrated score is a good fit for the action, and retro-inspired audio touches - from the iconic title-screen track to the classic Pac-Man death jingle - will be well appreciated by older players. Voice acting - both hammy and heartfelt in equal measure - helps give the game a Saturday morning cartoon feel, with spoken lines for nearly every character and cutscene in the game. There's also a unexpected multiplayer mode, where up to four players can play as the ghosts in a 3D game of classic Pac-Man, competing to be the first one to nab the computer-controlled Pac-Man and end the round. It does seem like a missed opportunity that no one can play as Pac, for some Nintendo Land or Pac-Man Vs.-style asynchronous multiplayer, but it's still a cool concept and lots of fun with friends or family. 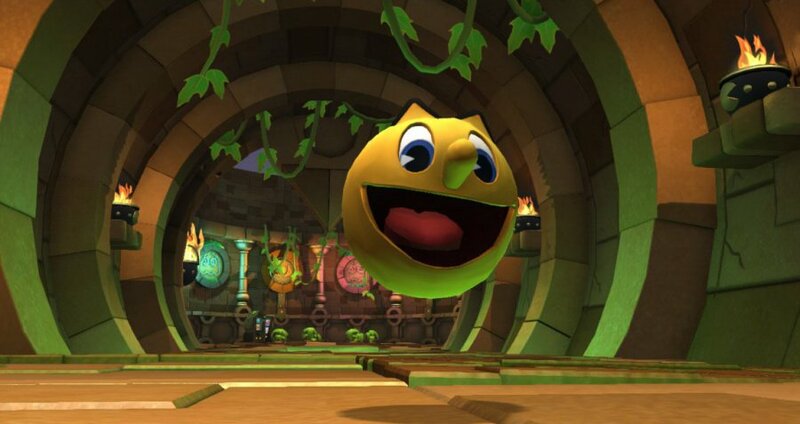 Pac-Man's latest adventure is kid-friendly in the best way: this is a solid, enjoyable 3D platformer that's built with a level of care and polish not often seen in games aimed at this audience. A sometimes-uncooperative camera puts a bit of a blemish on the experience, but fun transformations, plenty of extras, and lots of personality more than make up for it, and an array of retro references ensures that kids-at-heart will enjoy themselves as well. Young fans of the show will eat Ghostly Adventures right up, but it's also worth a look for anyone after a fun, simple platformer with old-school charm. This is surprising! I was positive this would turn out to be shovelware. Anyway, I've got way toomuch on my plate right now, but who knows - I might pick this up at a sale in the future. Still, this is on my radar for next March, if it is budget-priced also in Europe. Can't believe they didn't do a Mario Chase/PacMan vs. game. I would put Mario Chase as one of my top games of 2012. I honestly miss the Pac-Man World games. The second one was my favorite of the series. But enough about that, its nice to see that Pac-Man hasn't lost his luster in the 3D Platforming genre. I still didn't think this game was going to do very well. I might pick this one up after I finish Super Mario 3D World. Would you recommend this game for a five year old that struggles a good deal with Mario plarformers? Would this game serve as good practice? pac-man dx on other consoles is amazing its like a disco. Will this game come to steam? Really? This is quite unexpected! I might pick this up sometime! Playing the game now. Very solid platforming with decent variety. My only real complaint is that textures are reused a little too often giving a bit of a budget feel. The Aztec themed levels are downright great. I just wish the fire, ice, and city levels were as inspired. @raghouse That bothers me much less than people using 32GB of textures and then not optimising properly it so you don't get stuttering. (Seems to be fairly common on Wii U disk versions). I love me some hidden gems, i may get this down the line when i'm not drowning in a sea of amazing NIntendo Wii U exclusives & 3DS games. Nice! I actually didn't think this would get very much praise, but I am glad I was wrong. I'm always interested in 3D platformers as long as the production value is decent, and it has a good variety of collectibles in each world. I'll definitely check out more information about this game soon. Is this disc-only or also a download? Pac-Man's face looks so unfriendly. Sounds interesting. I may get this and Sonic Lost World, as the latter's demo wasn't really bad. I wonder if it represents the whole game or not. Pac-man? Referencing Gears of War? any one know how the 3DS version stacks up in comparison? Picked up a 2DS for my young son... might download this to it for him. I'm going to be that guy and say... well a seven isn't a bad score. Maybe it's Morgan's thoroughness that highlights the more praiseworthy sections, but a lot of people will overlook the details in lieu of the number at the end. In a crowd of standout games, a 7 may not lure in the audience this title (perhaps) deserves. Fantastic review, Morgan. You've convinced me that this is a game that belongs in my collection. Oh, color me surprised! Good to see Pac-Man hasn't turned into a joke again! The last few platformers were pretty awful (except for Pac-Man World on PSX). All right! I'll try to pick up for the holidays! Crazy, when I saw this game on the shop with the budget price I thought it would get around a 3. Hmm! Sounds like good fun! Definitely the way I like my Pac-Man platformers, whimsical and fun! And that's nice to hear that it has no backtracking, that was the one thing I didn't like about Pac-Man World 2 on GBA; I jokingly (and lovingly) refer to it as "backtracking the game", lol. I hope the 3DS version turns out just as good! I...........have a fever, and this game is the cure for it (or not). @MaximusMansteel I would! It's definitely simpler platforming than Mario, and Pac's homing attack requires a lot less precision than stomping Goombas. Plus the controls are nice and simple - no separate run button for instance (which is often needed for clearing gaps, etc. in Mario). That said, I think the best "practice" platformer ever is Kirby's Epic Yarn - fun and beautiful from start to finish & there's no way to die! @Sean_Aaron It's on the eShop as well! @DRL Thanks mate! I think you'll get a big kick out of it! I like Namco. They have a respect for classic video games, and it's nice seeing them give the Wii U a little bit of help, even though they'll probably barely make a profit and hopefully not a loss. I actually enjoyed this more then Sonic Lost World. I bought both and this was just more fun for me to play. I would recommend it to any one who has a Wii U and loves platformers. Nice! Makes me pine for a release of Pac-Man 2: The New Adventures on VC... What a strange but entertaining game that was. Thanks for the review! Maybe I'll get it down the road when the price drops. @daveh30 if I'm not mistaken its a little different, 3ds/2ds version is a side scroller and Wii U is more open world. Hmm, I get 40% off at Fred's on Black Friday and this may go into my cart as a stocking stuffer for my son. I love having a 9 year old son to buy games for. I can get some of them for him, even though I secretly want to play them myself. Buying them for him keeps my wife less irritated at me for buying yet another game. I picked up the 3DS version pre-owned at GameStop, and I dig it! Can't wait for you guys to review it. @daveh30: As I said above I like the 3DS version. If your son like side scrolling platformers, chances are he'll like it as well. @zipmon Cool, nice to see that Namco is one of the third parties putting their wares there; I'll be watching for it next year then! Just looking at this game reminds me of all the great sleeper titles on N64, and that's not a bad thing at all. I'll get this one at some point. @Zach Yeah that's a pretty good one, and one of the few Pac-Man games not going to be included in the upcoming Pac-Man Museum on the eShop. This reminds me of the N64 platformers of old, and those kinds of games need to appear more often. I might pick this up in the future. Why oh why can't Nintendo make more 3D platformers?? They should be updating their older platforming IPs with with games like this. Ice Climbers, Kid Icarus, Kirby, or a new 3D Donkey Kong. Don't get me wrong, I love 2D games, but there's only so much you can do with two dimensional movement. This game has some solid word of mouth too, so I'm not surprised by the score. Good to see some of these solid middle-tier games on the Wii U.
I don't see myself picking this up, but if Namco/Nintendo port over Pac-Man Vs., I'll buy that in a second. I had no interest in picking up this game but the multiplayer mode almost sold me on the game until I found out that nobody can control Pac-man. Why the [email protected]#^#$^#$% are developers NOT taking advantage of the fact that the Wii U can support 5-player local multiplayer?! One feature… just one bloody feature would have been enough to sell this game to me. Stupid, stupid Namco. Ahh I love Pacman games. Definitely will pick this up! @Nintendo4Sonic cod and the latest batman are shells of their predecessors. I rented Batman Arkham Origins,I got 50% through it before packing it up and sending it back to gamefly. It really was mediocre at best. The latest cod does nothing new or fresh with the series. It's being milked, and I'm going to guess the next one will do even worse. Eventually people are going to get sick of the same game as they are just repackaged map packs. The arcade games within are new games that resemble old arcade games. There is a Defender type game, a Scramble like game, Tanks in a maze game, and one where you fly through a tubular environment dodging cars and shooting ghosts. The last one is probably the most fun as it has the greatest challenge. I agree. Didn't mean to sound down on the game. I would recommend it to anyone that likes the 3d platforming genre. They need to remake Pacman Vs. for the Wii U! Would be the perfect system for it, and I would happily pay 25 bucks for it. @JustinH Agreed. Love me some Pacman Vs.!! This game is $19.99 right now on the eShop in the USA if you are interested. Well that sounds like it's right up my alley! I'll definetly need to pick this up eventually. Great read! I believe I am sold. I love old school 3D platformers! @Nintendo4Sonic Just because something’s got a big name attached to it doesn’t mean it should get a big score. Wow! I was totally expecting this to get a 5 or lower! Might pick this up sometime. My nephew received this game as a present recently and we tried it out on the U. It's surprisingly fun! Nothing special, mind you, but I'll take a fun, solid platformer over shovelware any day.